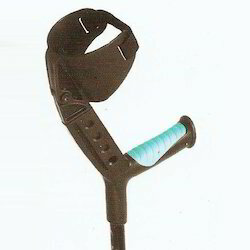 Our product range includes a wide range of walking stick (l type), pod 15,19,22 mm, walking stick (soft top handle), walking stick tripod, walking stick quadripod and auxiliary crutch. 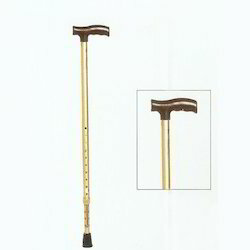 Being the most respected organization guided by experienced and knowledgeable professionals, we provide Walking Stick (L Type). 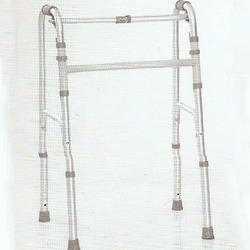 This walking stick is well tested on several parameters of quality for ensuring its excellence. 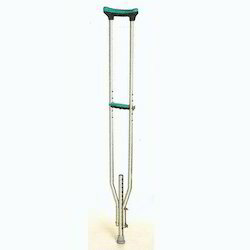 Our walking stick is manufactured utilizing the utmost quality material and latest technology at vendor’s hi-tech manufacturing unit. Anatomical ABS Handle is durable, provides comfortable grip and is nice to touch. 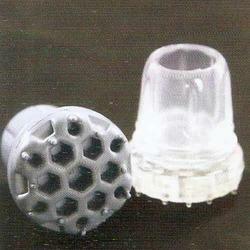 We are a noteworthy organization in the domain, engaged in offering a high quality range of Pod 15, 19, 22 mm. The available products are manufactured under the direction of vendor’s professionals using supreme quality material following set standards. These products are high on demand in the market due to its TPE construction ensures a very long functional life. Customers can easily avail these products from us on diverse specifications. We are an acclaimed name engaged in offering our precious clients a superior quality range of Walking Stick (Soft Top Handle). 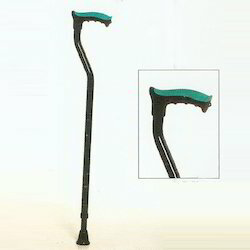 This walking stick has double molded handle with extra soft cushioning provides comfortable grip. Our walking stick is manufactured using high quality material and sophisticated technology in fulfillment with the set industry standards. 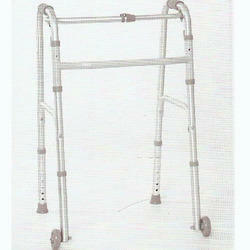 Besides, the offered walking stick is provided within a stipulated time frame with several specifications. Owing to perfection and quality oriented approach, we have carved niche in the industry by offering Walking Stick Tripod. Broad base imparts high stability & fail angle, giving higher confidence. Offered stick tripod is inspected on varied parameters in order to supply a flawless range. Our vendors manufactured this stick tripod using excellent quality of material & contemporary techniques by vendor’s highly skilled technocrats as per the norms of industry. Broad base with high stability and confidence. Higher load bearing and durability. Left and right hand use flexibility. Light weight aluminum body is strong with high weight bearing. Anodizing enhances the aesthetics. Anatomical ABS Handle is durable, provides comfortable grip and is nice to touch. Excellent workmanship, pleasing looks, smooth functioning and customization. Made from high strength grade aluminum. Ergonomically contoured underarm piece with very comfortable, highly resilent, elastomeric, cushioning pad. Soft padded, anatomically shaped, hand grip with a flat top for enhanced user comfort & pleasure. Easy height adjustment with 1 inch increment. Pods with high wear resistance & excellent traction. Customized sizing of elbow and leg piece improve weight bearing & user confidence. Flipping elbow piece with loop tightening ensure better user confidence, allows free use of hands. Soft top handle improves cushioning, reduces hand fatigue. Polymer elbow piece is anatomically shaped, strong & comfortable. Excellent workmanship ensure easy size customization & improved aesthetics. Both Reciprocating & conventionalmodes. 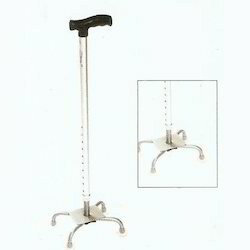 Switch by convenient lock pin.In reciprocating action, two legs remain grounded, ensures stability for weakpatients. Maintains natural gait. Strong, anodized aluminum body is durable, light in weight, rust proof with pleasing aesthetics. Folded height 10 cm only, easy to transport or store. Smooth functioning, comfortable use with pleasing looks. Durable polymer wheels provide agliding movement. Wheels are mounted on a swivel joint, which ensures smooth 360 degrees turning radius. Ideal for very weak patients. Strong anodized aluminum body is durable, light in weight, rustproof with pleasing aesthetics. Folded height 10 cm only, easy to transport or store. Smooth functioning, comfortable use with pleasing looks. 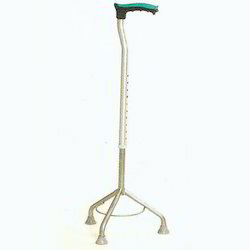 Looking for Walking Aid ?